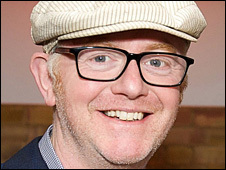 BBC Radio 2 presenter Chris Evans has signed up to replace Adrian Chiles as co-host on Friday's edition of The One Show, it has been announced. Evans, who presented TFI Friday and Don't Forget Your Toothbrush on Channel 4 during the 90s, will join Christine Bleakley on the BBC One programme. Evans said he was "honoured" to be involved in what he called a "much loved institution". A BBC spokesperson said that Chiles' contract was "still being negotiated". The spokesperson added that the BBC are "keen" that he stays with the show as he is a "valued member of The One Show team". The new hour-long Friday edition will include new features and guest slots that the BBC said will be revealed in the forthcoming weeks. Last year, Evans made his TV comeback appearing as a guest on The One Show. "I think what Adrian and Christine have done with the show is fantastic," said Evans. "It has become a much loved institution in a relatively short space of time and I am honoured to be able to be joining the team. For me, Fridays have always been a little bit special and I want to do my bit to welcome people to the weekend." BBC One controller Jay Hunt said: "The One Show is without doubt one of our most popular programmes and I am thrilled that Chris will be joining such a successful team. "His unique presenting style and infectious enthusiasm will be a great addition to the show."